The Iowa Gardener newsletter is a joint effort between two writer-editors who are also passionate gardeners, Veronica Lorson Fowler and Benjamin Allen. 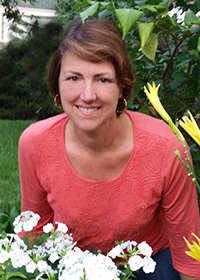 Veronica Lorson Fowler is a garden writer and complete garden geek living in Ames. She is the author and editor of a number of gardening books, including "Gardening in Iowa," the proceeds of which go to Reiman Gardens. 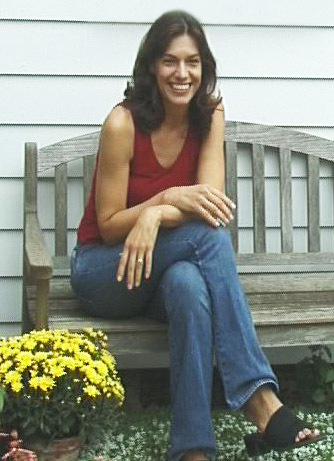 The former editor of Better Homes and Garden's "Flower Gardening" magazine, she is now a freelance writer and editor who has contributed to a variety of other gardening books and many magazine articles in Better Homes and Gardens, Country Home, Horticulture, Garden Design, and others. She is also a regular contributor to Iowa Gardening magazine. A graduate of Iowa State University and a Master Gardener, she has lived in Ames for more than 20 years, where she has juggled work and raising three children with tending a sometimes messy but always highly varied garden. To take a virtual tour of Veronica's garden click here. Ben Allen has been in the publishing industry for more than 20 years as a reporter and editor. He currently writes and edits materials for publication both in print and online on the subjects of home improvement and gardening. He was an executive editor of home improvement, home design, decorating and gardening books at Meredith Corporation, where he helped create more than 100 books under the brands of Better Homes and Gardens, Ortho, The Home Depot, Stanley, Miracle-Gro and Scotts, among others. He teaches part time for the Communication Studies Department at Central College in Pella, Iowa. Ben has a master's degree in journalism from the University of Kansas—Go Jayhawks!—and an MBA from Iowa State University—Go Cyclones! Part of his childhood was in Columbia Missouri—Go Tigers! (Ben is often confused on who to root for—he has decided it's best to root for the offense.) He also completed the Master Gardener courses at Iowa State University. His Craftsman-style home built in 1912 and way too much shade in his garden give him ample opportunities to put his do-it-yourself and gardening skills to good use. He seasonally saves seed from Yucatecan corn he annually grows in his garden as an reminder of just how much labor goes into making corn tortillas from scratch and just how good food grown in your own backyard tastes. Ben lives in Des Moines with his wife Marguerite Fitch and spoiled cats named Tiger Lily and Manchester. The Iowa Gardener advertising director, Sarah Thorn, started to garden as an end-of- day stress reliever and has become a plant geek. When living In the Washington DC area she found a community garden plot to raise fresh a few fresh vegetables. Living in the shade filled Beaverdale neighborhood of Des Moines she has taken on the challenge of filling her raised bed gardens with cutting flowers and perennials. The yard has just enough patches of sun to raise a few vegetables. Sarah launched her own public affairs consulting firm after over 20 years in the corporate world. Sarah is a "farm kid" from eastern Iowa, with an Agriculture Business degree from Iowa State University. She is working to complete the requirement for Master Gardener certification by this fall. Sarah lives in Des Moines with husband Bill and a very spoiled golden retriever named Ginny.